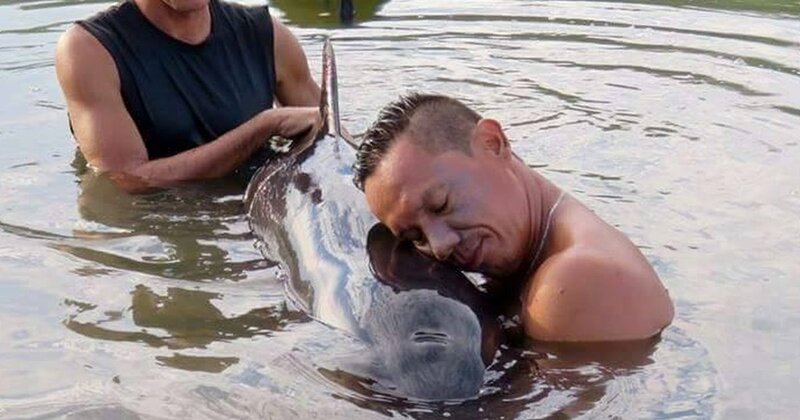 A group of surfers came to the aid of a baby pilot whale, after the animal became stuck in the mouth of a river at a beach in Costa Rica during low tide. Mauricio Camareno, one of the surfers, said they noticed a “black lump” and heard cries of distress. When they investigated, they found the baby animal around 200 feet up the river and struggling to breath. “She was very weak and could not keep afloat,” Camareno told Amelia Rueda. The men jumped into the water to hold the baby up so that she wouldn’t drown. Although they called the Coast Guard and environmental ministry to report the stranded whale, neither agency responded to the scene. After holding her up for more than six hours, the group of surfers noticed she had regained her strength. With high tide, the surfers brought her out to deeper waters. After several attempts, she swam away, hopefully to be reunited with her pod. Share their act of kindness with your family and friends!